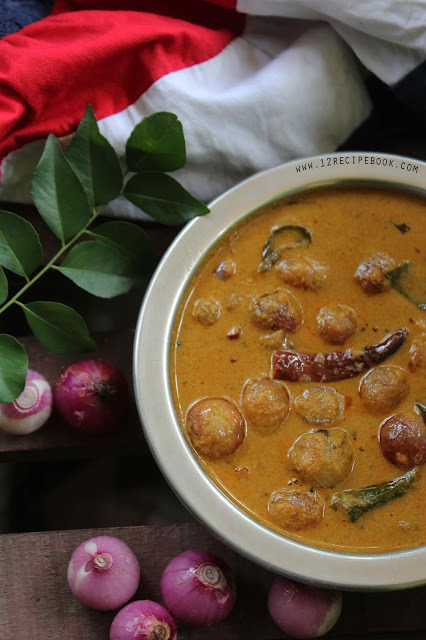 Theeyal is a roasted coconut based gravy served normally along with meal. There are different types of theeyal recipes using different veggies like bitter gourd, ladies finger, yam, brinjal etc. We can make them with sea foods too. 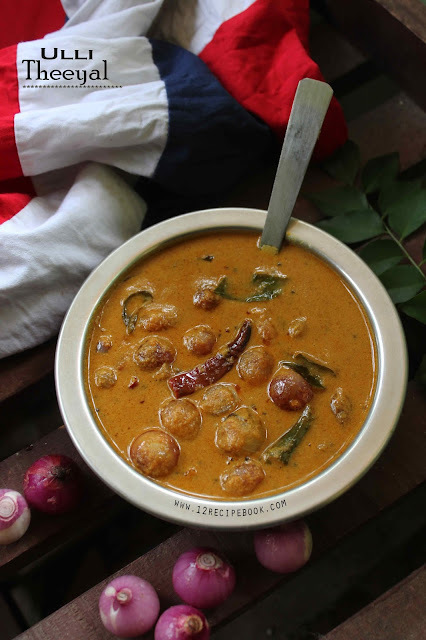 Here is one of the most common and comforting theeyal recipe using shallots (small onions). Check out the simple recipe and give it a try. Peel the skin of shallots and wash; You can chop them in to two or it is too small no need to chop. Soak tamarind in 1/2 cup of hot water and extract its pulp. Heat a pan with a teaspoon of oil; add red red chilly and roast for few seconds; add coriander seeds, cumin seeds, pepper corns and fenugreek roast for about one minute in slow flame and add grated coconut . Add turmeric powder; mix well and switch off the flame. Allow to cool and transfer in to a blender. Add little water a make a smooth paste out of it. Heat a pan with coconut oil; splutter mustard seeds. Roast it for about 6-8 minutes until soften. Add the coconut paste and tamarind pulp water. Add salt and more water to require a gravy. Cook for about 10-15 minutes on medium flame or until the curry slightly thickens and oil floats on top.